Have a Happy Birthday with Botanical Blooms Photopolymer Stamp Set and Designer Series Paper! Stampin' Up! Designer Series Paper has beautiful colors and designs that are a perfect compliment to any project! 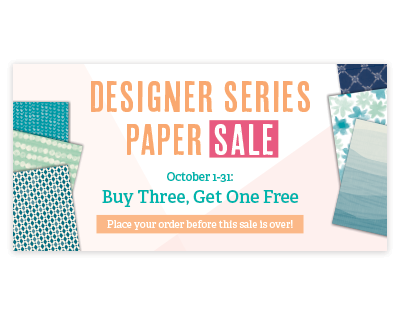 So, don't miss the opportunity to get all your favorite Designer Series Paper with this amazing BUY 3 and GET 1 FREE! Now through Oct 31st! This week's DOstamperSTARS Challenge was so much fun being able to show how easy it is to use the brilliant colors and designs of Stampin' Up! Designer Series Paper! So, let's get started with the fun! The supplies that you will need are Botanical Blooms Photopolymer Stamp Set #140757 and Botanical Builder Framelits #140625. Basic Black Cardstock #124267, Daffodil Delight #119683, Sahara Sand #121043, Pumpkin Pie #105117, Old Olive #100702, Soft Sky #131203, and Botanical Gardens Designer Series Paper (retired). Layering Ovals Framelits #141706, Seaside Textured Impressions Embossing Folder #141481. 1) Cut two Basic Black Cardstock 5 x 6 1/2, two Daffodil Delight 4 3/4 x 6 1/4, and Botanical Gardens 4 1/2 x 6. 2) Die cut Pumpkin Pie Cardstock for pumpkins with Layering Ovals Framelits. Die cut flowers and leaves with Botanical Builder Framelits on Sahara Sand, Soft Sky, and Old Olive Cardstock. Die cut stems for pumpkins in Sahara Sand with Thoughtful Branches Thinlits. Stamp stems in Soft Suede with Thoughtful Branches Stamp Set. 3) Dry emboss pumpkin ovals with Seaside Textured Impressions Embossing Folder. 4) Sponge edges of pumpkin ovals with Pumpkin Pie Ink #126945, edges of Soft Sky flowers with Perfect Plum Ink #126963, and leaves with Old Olive Ink #126953. Curl edges and center of pumpkin ovals. Glue together pumpkin pieces with Multipurpose Liquid Glue # 110755. 5) Die cut Sahara Sand and Old Olive Cardstock. Mat sentiment tags with Layering Ovals Framelits. 6) Stamp sentiments with Perfect Plum Ink #126963. 7) Cut two Daffodil Delight into 4 3/4 x 4 1/2 and 1 x 4 3/4. Cut Botanical Gardens into 4 1/2 x 4 3/4 and 1 x 4 1/2, die cut long edges of Daffodil Delight and Botanical Gardens with Botanical Builder Framelits. 8) Adhere pieces to inside of card with SNAIL Adhesive #104332. Adhere pieces to front with Stampin' Dimensionals #104430. Enjoy Fall! It is a fun time to be creative! SHOP NOW for an Amazing opportunity to SAVE on Stampin' Up! Designer Series Paper! Only for a few more days, SALE ends October 31st!